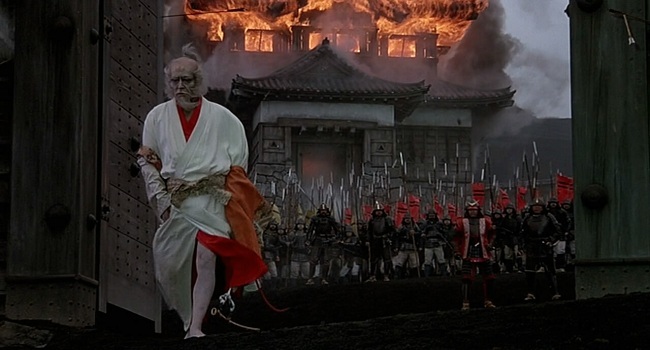 Inspired by Shakespeare’s play King Lear, Akira Kurosawa’s Ran is an epic tragedy in every sense of the word. The film documents the slow destruction of the mighty Ichimonji clan. The head of the clan, commonly referred to as the Great Lord, is Hidetora (Tatsuya Nakadai), a man who brought his clan to prominence after 50 years of war. Now an old man, Hidetora considers it time to step aside and divide his land between his three sons Taro (Akira Terao), Jiro (Jinpachi Nezu), Saburo (Daisuke Ryû). Hidetora gives his throne to the eldest son, Taro, and castles to both Jiro and Saburo. Besides informing his sons that he plans to spend time at each of the sons homes, Hidetora instructs Jiro and Saburo to support Taro. Taro and Jiro immediately flatter their father by praising the way he has ruled the land and acknowledging that no one can ever take his place. Saburo, on the other hand, thinks his father is making a huge mistake by dividing the land the way he did. Rebuking the idea of the brothers being able to work in unison, Saburo points out that Hidetora’s children were “weaned on strife and chaos.” Infuriated, and blinded by pride, Hidetora banishes Saburo and disavows any acknowledgement of having a third son. However, Hidetora is about to find out that there may actually be truth in Saburo’s words. Once in power, Taro beginnings to make changes that remove any indication of Hidetora’s time on the throne. It quickly becomes apparent to many that Taro’s wife, Lady Kaeda (Mieko Harada) is more influential to Taro than she initially appeared. Even Hidetora’s personal jester Kyoami (Pîtâ) points out how easily swayed Taro is, mocking that he is “like a breeze” moving back and forth. Fed up with Taro’s ways. Hidetora seeks solace at the home of his second son Jiro. However, he receives an equally cold reception when he arrives at Jiro’s castle. Ostracized from his kingdom Hidetora slowly slips into madness as Taro and Jiro battle over the throne. As one of the most celebrated playwrights in history, the works of Shakespeare seem to receive new adaptations every decade. 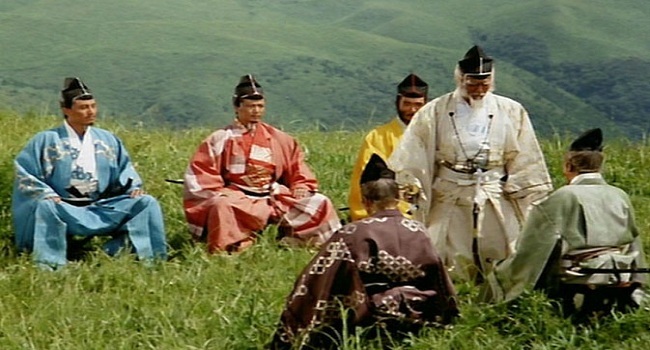 However few have been as visually stunning as what Kurosawa achieves with Ran. The film magnificently blends epic battle scenes with moments that would feel at home on the theatrical stage. This is most noticeable in the way Kurosawa positions his actors in various scenes. One example of this comes when Taro and Jiro attempt to eliminate their father who is residing in the smallest castle. With bloody bodies strategically placed around the castles, and flaming arrows soaring through the air, Hideotaro sits in the midst of it all in shock. It is powerful moment that emphasizes Hidetora’s realization of the severity of his actions. Kurosawa not only highlights Hidetora’s short-sightedness in regards to truly knowing his children, but also lack of foresight to realize that every action has ramifications. Ran masterfully displays this by incorporating various people whose lives have been greatly impacted for the worse as a result of Hidetora’s actions. Lady Kaeda, Lady Sue, and Tsurumaru have each lost family members and, in Tsurumaru’s case, endure great physical distress at the hands of Hidetora. However it is only Kaeda who still truly has the fire for revenge in her soul. Both Lady Sue and her brother Tsurumaru show Hidetora a level of compassion that is far more damaging than anything Lady Kaeda could do to him. The fact that Hidetora has done despicable things to amass his wealth, but still receives compassion from those he impacted, makes his decent into madness that much greater. Speaking of Hidetora’s decent into madness, this brings up the one flaw within an otherwise stellar film. Kurosawa spends way too much time in the last act showcasing Hidetora’s madness. You can only watch someone wander and rant so much before the meaning starts to become a little overbearing. Again this is a minor flaw in the grand scheme of things, but a noticeable one nonetheless. 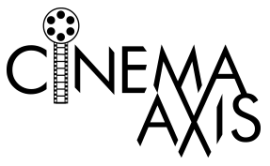 Regardless, this does little to impact the overall mastery that Kurosawa achieves with the film. Ran is a masterful film that is a must see for fans of both Shakespeare and cinema in general. Ran is a freaking awesome movie, and this was an excellent read. Thanks for the re-view of it Courtney, I enjoyed that reminder of its greatness! Very good review. While I still consider Throne of Blood to be Kurosawa's best take on Shakespeare, Ran is also a classic. When you add in the fact that Kurosawa was also getting up in age himself by the time he did Ran, the story of Lear probably resonated a little more with him. Glad you liked the review , Dan. It is truly an astonishing film. Throne of Blood is one of the many Kurosawa films I still need to see.